We are committed to nurturing a community of learners and connecting with people who share our passion of building a more sustainable world. By giving to one of the four areas below, you help to grow this community of change-makers and green leaders. We understand the importance of choosing a project or area you are passionate about. Please take a look at the different ways you can contribute and get involved in our non-profit school. Indonesia’s stunning natural environment and incredible biodiversity face some of the biggest environmental challenges. An After School Programme, engages 300 students from local village schools to join us in language and sustainability learning. The Local Scholars Programme, fully funds Indonesian students to attend Green School, receiving an international standard of education and support to become the next generation of Green Leaders in Indonesia. The Green Educator Course, gives Indonesian teachers the tools and skills to bring sustainability into local schools and education programs. One Indonesian child attends our After School Program for one semester. One Indonesian teacher trained to become a green educator. A Local Scholar’s education for one year. Green School understands and embraces the environmental challenges facing our world today. Named the Greenest School on Earth, we are committed to being at the vanguard of creating a campus and community, committed to sustainability. With students leading the way, we are making an impact. The school Bio Bus service runs on used cooking oil, reducing CO2 emissions by 3.5 tonnes per month. 900+kg of waste is collected each month, rather than ending up in water-ways and burn piles. Green School is powered by 80% solar and micro-hydro renewable energy. Classrooms are made entirely from bamboo. We harvest food from school gardens and use composting toilet systems. Youth movements such as Bye Bye Plastic Bags and the annual Sustainable Solutions Expo are becoming global phenomenons. Supporting these projects enables them to continue to grow, improve and to be shared with other schools and young people around the world. The collection of more used cooking oil to power the BioBuses. The building of a bicycle cart to collect trash from local villages. Become an official partner of the annual Sustainable Solutions Expo. We believe education is not only a process to prepare children for the future, but that it enables children to make a difference in the world today. 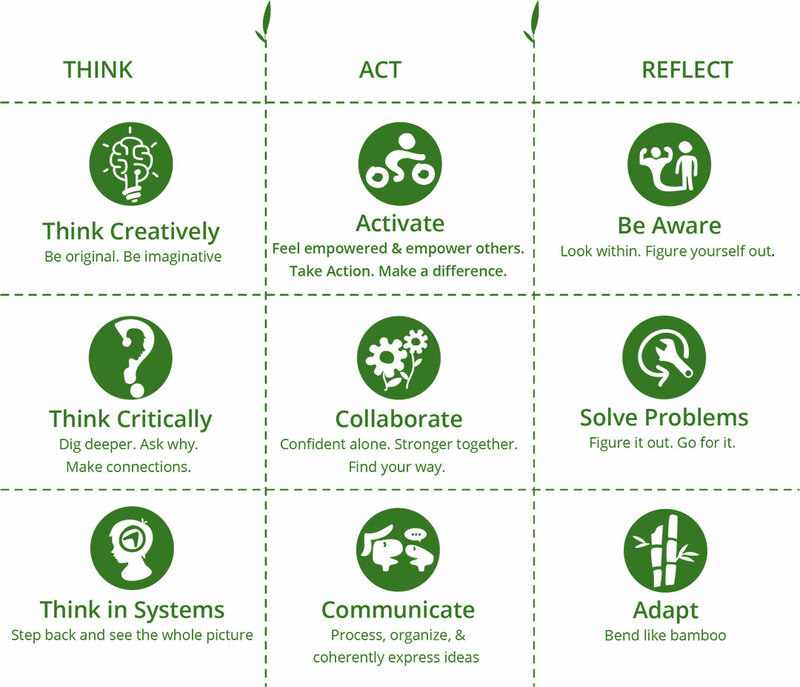 Giving children, time, support and tools to incubate ideas and develop sustainable solutions is at the heart of the Green School approach to entrepreneurial learning. LEAP Academy is an exciting, progressive, entrepreneurial program which allows students to take on a real-life problem to solve. By sponsoring a LEAP Academy project, you support progressive education, the creation of low-tech and high-tech solutions to real problems, and the incubation of social enterprises and entrepreneurs. $500 kick-starts a LEAP Academy project. $5000 Allows you to initiate a project of your choosing. The education sector is falling behind the pace of change, globally. 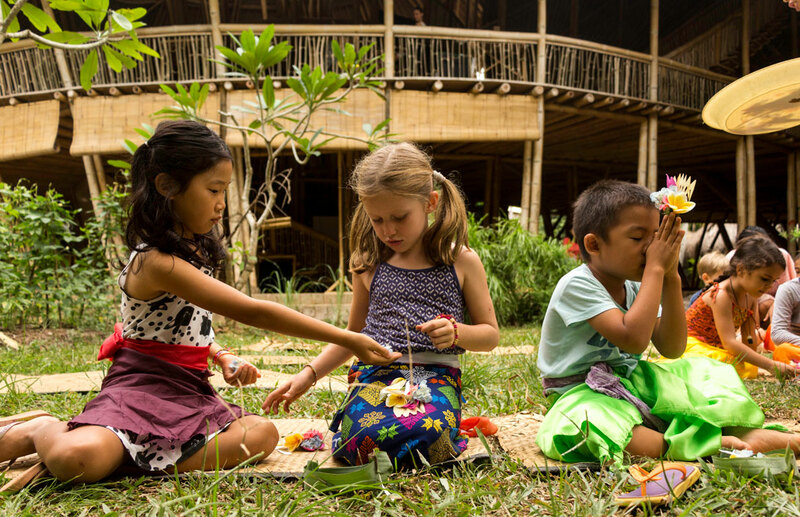 The Green School progressive education model prepares children for the world of tomorrow by working with problems and opportunities which exist in the world today. Green School’s hands-on, integrated and project-based learning has captured the hearts and minds of educators, institutions and individuals from all corners of the globe. Science equipment including environmental testing kits and student laboratory equipment. Musical instruments, particularly indigenous instruments. Student software products and licences, particularly for design. The administration of all fundraising activities by the not-for-profit Yayasan Kul Kul, known internationally as Green School Bali, is overseen by the Green School Board of Management. The Board is a representative body, legally bound by Articles of Association and Bylaws. The Board executes its duties in an open and transparent manner, entirely consistent with the mission and values of Green School, Bali. The Board reviews quarterly the progress of all fundraising and ‘Giving’ programs including regular audits and performance against established criteria, objectives and financial targets.